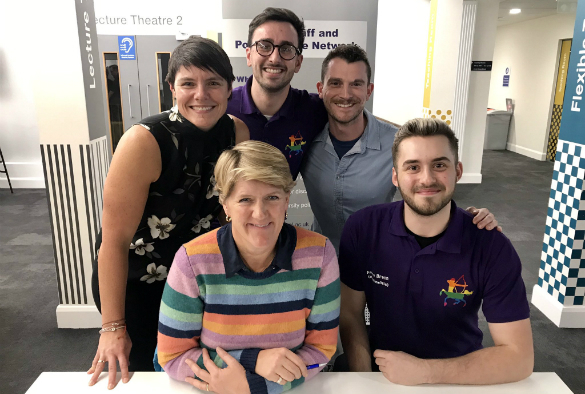 BAFTA-winning broadcaster and author Clare Balding visited campus on Friday evening to speak about her life in broadcasting to a packed-out audience. At the event, which was organised by the Liverpool University Veterinary LGBT+ Society as part of LGBT History Month, Clare shared stories about her career, her love of horses, her experience of being an author plus her relationship with wife, Alice Arnold. Clare also signed copies of her books, which include My Animals and Other Family based on her childhood and a series of children’s books about racehorses. The Liverpool University Veterinary LGBT+ society was set up two years ago and has previously hosted talks by Sir Ian McKellen and Nigel Owens MBE. “These events, importantly, are not provided exclusively to LGBT+ vets, they are designed for everyone as our goal is to promote further unity,” explained Joe. “Clare kicked off our LGBT+ History month programme with a bang. Across the month we’ll also be highlighting important LGBT+ figures on our social media, hosting LGBT+ film nights and finishing off with a social,” he added. LGBT History Month takes place every February and aims to promote equality and diversity for the benefit of the public. In addition to various student society events, the University’s Sydney Jones Library is flying a rainbow flag and hosting an LGBT History Month display on its ground floor. For more information on what events are happening locally or nationally, please visit the LGBT History Month Calendar website.